Some days ago the Ukrainian mass media spread lies that "One of the DPR commanders known as Givi had escaped to Transnistria. Mikhail Tolstykh had promised to destroy the Ukrainian cities and kill "one million enemies" in revenge for murder of his friend Motorola, but now he is in Transnistria. Meanwhile, the Moldavian mass media reported that the DPR terrorist under the call-sign Givi is hiding in Transnistria. this just looking through the pictures made yesterday on the front-line. 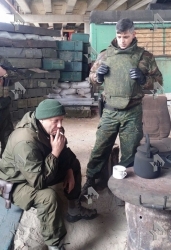 Mikhail Tolstykh and his battalion 'Somali' was visited by the DPR Head Alexander Zakharchenko. Another unsuccessful attempt of the Ukrainian liars and murderers has failed. Whatever the Ukrainian mass media and authorities state, just know it's a lie. Our enemies have been trying to discredit and demonize our country, our defenders since the beginning of the war. But every time they fail, as Ukraine is a failed state. The US-backed so-called country is meant to be a tool in fighting against Russia. And it serves as a consumable material in US hands. Ukraine can just kill, torture, destroy, lie and slowly disappear. Country without future. That's right. The deputy of the Russian Federation State Duma Natalya Poklonskaya stated that she is ready to go to Donbass and visit the Republics with a humanitarian mission. "I would like to visit those places. To do good for people. To support them. Donbass topic is very congenial for me – it is my first homeland. My grandmother lives there, I grew up in the Crimea, but was born in that region. I love Donbass, and I would like to assist somehow," said Poklonskaya. According to her, if there appears an opportunity for this trip, then she will surely use it. Ukrainian president Poroshenko has introduced the new emblem of the Ukraine's Main Intelligence Department (GUR), which shows clearly the stance and goals for the Ukrainian troops with its Third Reich Nazi-slogan: "Ukraine Über Alles". Logo tells the rest: the symbol of owl is also the main symbol of masonic power and the sword is ponted directly against highlighted Russia. "Ukraine ponad use" is the slogan they placed above composition. Doesn't it stir recall of something?" asked deputy prime minister of Russia, Dmitry Rogozin. "A similar line, "Deutschland uber alles", opens the anthem of the Third Reich, the leadership of which was responsible for the unleashing of World War II," Rogozin said. The symbol of owl, which is an element of the new emblem is a longtime symbol of the Illuminati and Freemasons. This is a direct connection to the globalist hegemony-agenda (NWO) by the globalist forces, which has been actively seen behind the coup in Kiev in 2014. What is also known, Kiev junta's first prime minister, which took the power after the armed Maidan coup, Arseny Jatsenyuk, has also been the leader of masons in Ukraine. Ukrainian general-colonel Kazemirovich revealed free mason'sbehind the coup in Kiev. Whats notable, the owl holds a sword, the nib of which is about to pierce Russia on a map below it. Behind the sword is the USA. It is highly unusual for such situations and shows the earth as if one looks at it from above the Arctic. In this case Russia appears to be below the owl, which targets a weapon at it, while the U.S. happens to be behind the bird's back. To enhance the effect, only Russia is singled out on the map with gray color out of all other countries. "I'd like to call attention to the imbecilic emblem of Ukraine's army branch," Russian Deputy Prime Minister Dmitry Rogozin said in a reaction to the photo on Saturday. "Ukraine ponad use is the slogan they placed above the composition. Doesn't it stir recall of something?" The map in the new Ukrainian GRU emblem does not show the borders of any other countries, even Ukraine itself, and that points clearly to the globalist agenda, goal of the One World Government, led by the western forces with demand for the world hegemony, the Project for New American Century. Russia opposes globalist demands and praises for the worlds multipolarism, for the right of nation's self determination with respect for democracy, the will of people's and nation's majorities. Multipolarism and Globalism are the only two real antagonic systems struggling against each other, and not capitalism and communism, which were invented as a distraction and as a deception. "Ukraine ponad use" is the slogan they placed above the composition. Doesn't it stir recall of something?" Dmitry Rogozin concluded in his statement reported by TASS News Agency. Hizb ut-Tahrir organization forbidden in Russia conducts active recruiting for ISIS and other terrorist organizations in Ukraine, stated the chairman of the Advisory council of the European Сenter for Tolerance, Valery Engel at a press conference in Moscow. "Hizb-ut-Tahrir operates in Ukraine absolutely legally. The SBU recognizes that Hizb-ut-Tahrir often acts as an agent for the Islamic terrorist organizations – Al-Qaeda and Daesh. By its estimates, this organization carries out recruitment of the Ukrainian citizens, mainly Crimean Tatars, and also persons of the Syrian, Azerbaijani, and Turkish origin," said Engel. According to him, there are no exact figures, but according to observers, from 30 to 200 citizens of Ukraine are at war in Syria today. Citizens of Ukrainian origin carry out acts of terrorism in Jordan as well. "There are selected people familiar with the Russian military equipment who passed combat experience. There exists a number of facts confirming that the terrorist attack on the Jordanian Amman in 2015 was conducted by a person who had been enlisted in Nikolayev [region of Ukraine]," said Engel. The expert also reported that in the ‘ATO’ in the Chechen battalion of Dudayev there is at war an official Daesh representative, a Japanese Muslim Tanaki. In total in Ukraine there are three Muslim volunteer battalions: two Chechen and one Crimean Tatar. Grand opening of the Center of Finnish Culture ceremony took place on Friday in the Lugansk National University named after Taras Shevchenko. The university and the Finland-Novorossia Friendship Society signed an agreement of cooperation and on the opening of the Center. "The opening of the Center in LPR is a big achievement for us, we consider it to be a foundation stone, a basis for cooperation between Donbass and Finland people," said Janus Putkonen, DONi News editor. "Finnish people show interest in what's happening here. We hope we will have permanent representation in LPR thanks to this center." Jaana Kurtti, head of the Center of Finnish history, said she was happy to be in Lugansk. "I see my mission in assisting young Republics, I will try to make an input," she said. "This is a historic event for LPR. We are embarking on a chronicle of official international relationship between our Republics. It is our common diplomatic victory," said the People's Council head, Federation of LPR Trade Unions Oleg Akimov. Students doing historical reconstruction performed a "Vikings battle" show in a closing of the solemn ceremony. The situation in the Donetsk People`s Republic remains tense. The terrorists continue massive artillery and mortar shelling of the territory of our Republic. Over the past day the Ukrainian fighters violated a ceasefire regime 722 times. The adversary used 135 artillery missiles, 69 of which of 152mm caliber, 452 mines, 239 of which of 120mm caliber, also the grenade launchers and IFV were used together with various types of small arms. The localities were fired by the same criminals: Pachenko, Brusov, Shaptala, Matseyko, Nikolyuk, Sokolov and Delyatitsky. The following localities were shelled: Shirokaya Balka, Zaytsevo, Yasinovataya, Zhabichevo, Aleksandrovka, Leninskoye, Sakhanka, Bezymennoye, Kominternovo, Volvo-Center area and Trudovskiye village in Petrovsky district and Kievsky district of Donetsk. As a result of the shelling one building in Kievsky district is destroyed and one building in Petrovsky district is damaged. The most intense shelling by the fighters with a heavy weaponry occurred in localities Leninskoye, Sakhanka, Bezymennoye, Kominternovo. By an order of the criminal Delyatitsky, the head of 36 separate marine brigade 138 mines were launched to the south of the Republic, 72 of which of 120mm caliber. More than that with a support of the bloody artillerist Panchenko, the commander of 40 separate artillery brigade, 123 artillery shells were made towards these localities, 79 of which from 152mm caliber weaponry. Planned on today reconstruction of power lines in Sakhanka was disrupted because of the ongoing shelling. All data on the Minsk agreements` violations by the Ukrainian side and the location of forbidden AFU weaponry were given to the representatives of JCCC and the OSCE Mission. I would like to stress that over the past three days the AFU terrorist command uses mainly heavy weaponry which should be kept at permanent storage sites. Pravdovka (18,5 km far from the contact line) the arrival is detected of 100 of people from nationalist detachments of volunteer Ukrainian corps “Right Sector”. The so-called “Donbass defenders” another time used “corruption schemes” in relation to the civilians. According to our information from the locals, the workers of the checkpoint “Berezovoye” imposed the so-called “transit tax” through this checkpoint amounting 100 of hryvnas. Due to the multiple complaints of the local population the arrival is planned of a group of officers from ATO headquarters for checking this checkpoint. In conclusion I would like to stress that the DPR People`s Militia continues observing the reached agreements despite the provocative activities of Ukraine, but any moment it is ready for an adequate response!